Choosing which pattern to use for my project was the hardest part! Ultimately, their pattern, Cute as a Button was my first choice. I have a collection of buttons - modern and vintage, so this pattern really spoke to me. Now, for my own version of this adorable pattern, I decided to scale things down. My blocks are one third of the size of the original version in Modern Plus Sign Quilts. The thread used for my appliques is Wonderfil's Accent, which is a 2 ply rayon in 12 wt. It stitched like a dream and adds some weight and contrast to my tiny button appliques. My mini quilt has a narrow border of bright pink print cotton on the sides and larger borders in a lightweight linen for the top and bottom. A sweet fussy cut label adds another personal touch and an extra detail to my quilt. Finishing things off, there's a fun polka dot binding and some wavy quilting! A fun make full of whimsy and celebrating one of my favourite notions. 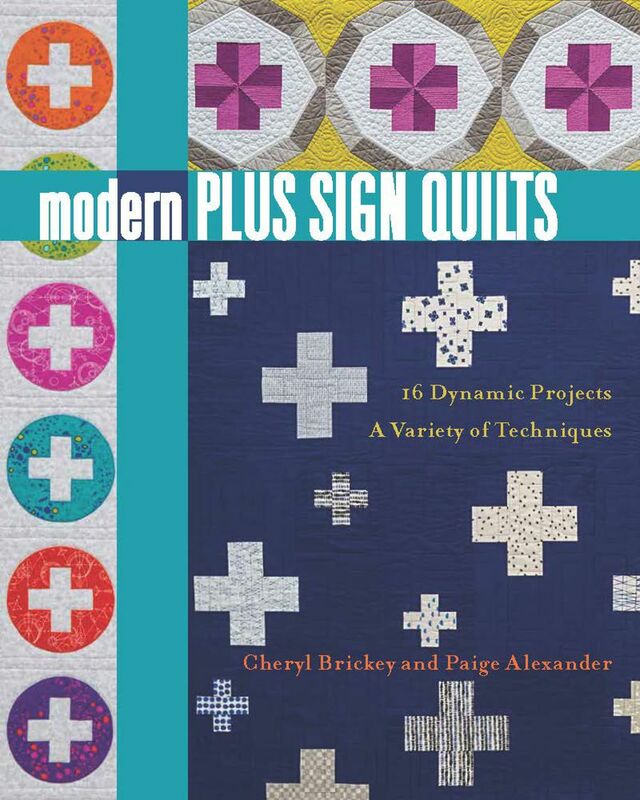 Thank you, Cheryl and Paige for not only the pleasure of diving in to enjoy sewing one of your wonderful designs found in Modern Plus Sign Quilts, but also in being a part of introducing your beautiful book here in blogland during this hop! Want to see more insider looks? How about a chance at one of their daily giveaways during the hop? Make sure you visit both authors' blogs! Thank you so much for stopping by! Please check out all the other wonderful stops on this 2 week hop!!! The dark thread makes the buttons stand out, and love the borders top and bottom, a label and super binding. This is just adorable! Your final photo looks like a magazine shot! Wow too cute! Love the sketch stitching! Katherine, I love the sketch stitching in place of traditional applique and with the contrasting thread, it stands out beautifully! Now, I want to try that! Thank you so contributing to the book hop! Love this! It came out wonderful - I really like the contrasting thread. How cute! I love all the little touches on this, like the handmade label and the wavy quilting. The pinks are fabulous and I think the binding is my favorite part. What a great finish and interpretation of the pattern! Wow, I love your take on Cute As a Button!!! The outline stitching is just great!!! I'd like to ask what size yours ended up. Oh my goodness, I love this mini Katherine!! The tiny buttons and the black outlining thread are so awesome. I need to try this technique, thank you so much for being part of the hop! This really changes up the pattern. You've made it uniquely your own and I like it. Very creative. OMG.. so creative and fun and adorable! Oh my! What an interesting, amazing and beautiful take on this design! I love how you quilted it! It is fun to do something a little outside the box once in a while! I love everything you did with this design. The smaller version and the sketch applique is so fun! The mix of colors with the linen is really nice. Just darling! Interesting this week again the similarities between projects: yours and Tish's were scaled down! Love the shot with the buttons and thread-such a cute mini! Certainly does look cute as a button. You could just sit it on your table for some eye candy when needed. Very nicely done! I really like the way you quilted the black outlining. It reminds me of cartoon artwork. Very fun! And the bright, vibrant fabrics make it doubly fun! Great job! Oh my goodness, your mini is so cute. I love the fabrics you used and I love the outline quilting. Great job! Oh my this is amazing! I love everything about it!! How interesting, I love the whimsical look fun indeed, and it would be perfect as a dolls quilt too. A great version. I really like the black outlining on this - makes everything pop! This is such a darling version of the quilt. I love that you have added the black sketching to the top and I love the little label at the top. The binding is also sweet. I love how your verstion turned out and really really love the quilting on the buttons. It gives it just the perfect pop. I'm with Janice, it reminds me of a cartoon pop art piece. What a whimsical quilt! I love the sketch stitching! Such a cute button quilt. What a fun interpretation of this pattern! Fantastic! I just love the dark outlining of the pluses and "buttons" and the calm top and bottom borders. Nice photos, too. Well done! Beautiful little mini. I love the colors and how it turned out. Wow I love this!!! It really is such a great version of the project - the dark outlining of the plusses really gives impact. Wonderful! !